As one of Australia’s most experienced and respected agricultural journalists, Jon Condon has been part of the fabric of the nation’s beef industry for his entire life. 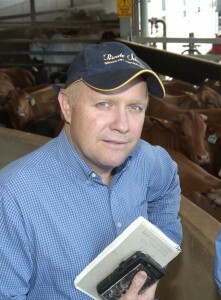 For 34 years he has specialised in reporting on the red meat and livestock industries, earning the trust and confidence of key stakeholders across the industry and developing a reputation for accurate, credible, informed and informative reporting. He spent his early life in the Northern Territory, where his family built and operated a successful export beef processing plant at Katherine, and an extensive cattle property in the East Kimberley. His first job at the meatworks was on the carton stapler, aged 11. After mastering the art of building meat cartons, he quickly graduated to the gut-house, aged 12. Only boarding school stopped his dream of further advancement to the hides, tallow and meatmeal shed. He holds a Business degree in marketing and communications and spent the majority of his early career with Rural Press Ltd. In January 2011 he established a new business with fellow journalist, James Nason, launching the Beef Central website and a specialised red meat industry communications consultancy. He is widely regarded as an authoritative commentator on industry affairs and regularly chairs significant national and regional industry events for the lotfeeding, live export and beef production sectors. As a communications specialist, Jon has contributed to the development of major industry programs such as the Red Meat Industry Strategic Plans 2010-15, and 2016-2020. He also sat for some years on the National Beef Genetics Extension Committee. He has co-authored two books on industry affairs – both histories – based on the Australian lotfeeding industry and Stanbroke Pastoral Company.